When former US President George W. Bush left the White House, he left behind one of the most unpleasant legacies in history. He redefined the US’ role in world affairs, tainted the country’s reputation, and left his successor with a political inheritance that seemed almost irrevocable. This, of course, says nothing of the terrible toll Bush’s policies inflicted on millions of innocent people, many of whom have so unjustly suffered and perished, and many more who are still held hostage to unyielding pain. While reputable author and world renowned journalist Deepak Tripathi agrees with this grim view, he doesn’t think all is lost. He believes that there is still a chance, an opportunity even to redress the injustice and reverse the terrible mistakes that were made. A compelling writer and a meticulous researcher, Tripathi’s work is both gripping and comprehensive. His latest book, Overcoming The Bush Legacy in Iraq and Afghanistan serves as a glaring reminder of what military power can do when it goes unchecked, and when it is combined with religious fanaticism or misguided political ideology. September 11 was the very opportunity which allowed the militancy of a small, detached and very influential group to define and eventually dictate the policies of the United States. “We stand together to win the war against terrorism,” Bush said on September 11. This was not simply a declaration of war against an elusive enemy, but also a declaration of unreserved violence and political imprudence, a blank check to reconfigure the world. Tripathi has done a superb job in addressing this topic. His successful approach is largely owed to his ability to locate the book within a most suitable historical and intellectual, as opposed to a purely political or event-driven context. This approach is a direct challenge to those who wish to examine the Bush legacy with September 11 as a starting point. Such a point might be considered rational, but it in fact represents a reductionist approach to history, and can only allow a limited understanding of its consequences. Tripathi has no such illusions. In ‘With Us or Without Us’, Tripathi emphasizes that a better understanding of the war in Afghanistan requires a historical analysis of the US-Pakistan relations that takes us to the Regan administration, and even earlier. Important names, dates and events appear in that historical examination, and are quickly tied into the immediate past and present. Without such context, there can be no true understanding of what took place in Afghanistan under the Bush regime, and what continues to unfold there. Tripathi’s narrative replaces the media’s caricatured account of both wars, and instead provides an objective study of rational events and those who shaped them. Indeed, it was not Bush and his neoconservative friends alone who wrought such disasters to the world. A whole array of individuals provided political cover and even, to a lesser extent, material support. In ‘The Battle for Afghanistan’, Tripathi shows how the likes of Tony Blair and Silvio Berlusconi colluded with Bush’s War on Terror. The bombs began falling on Afghanistan on October 7, 2001 and are yet to cease falling, despite the fact that Bush is no longer in the White House. This is largely what makes Tripathi’s book so important. It is not about Bush as a man, but Bush’s legacy. This legacy is an inheritance of other political legacies of various administrations and numerous interests. It continues to engulf, if not control US foreign policy to the present day. To detain that perpetual deterioration in world affairs, a proper deconstruction of history is a must. But why should we reiterate what we already know? Isn’t enough that most of us at least acknowledge already that to link Iraq to al-Qaeda and September 11, 2001 is absurd? That the weapons of mass destruction allegations were a baseless concoction and a complete fraud? No, it is not enough. A better understanding of the world doesn’t automatically make it a better place. Whether we like it or not, Bush and the neoconservatives got away with serious crimes. And the peoples of both Afghanistan and Iraq continue to suffer. The US must and will withdraw from both countries, largely because the stubborn resistance of their peoples will eventually prevail. However, Americans must discuss more than “an exist strategy”. They should also discuss how they got there in the first place, when they supposedly had a democratic system with political transparency and accountability. Obama might someday act upon his promises to shut down the US gulag at Guantánamo Bay, but the challenge will remain in understanding how America allowed few individuals to suspend such basic principles as habeas corpus, which Tripathi so ably traced to the Magna Carta under King John of England back in June 1215. 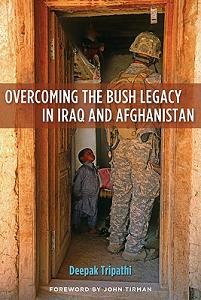 Deepak Tripathi’s Overcoming the Bush Legacy in Iraq and Afghanistan gives us a well structured understanding of a seemingly chaotic legacy, and answers many of the innumerable unanswered questions. It is an honest and formidable attempt at understanding one of the darkest periods in the history of America and the world. We owe him more than a thank you. He deserves an earnest attempt from us to understand his book, and to act upon his counsel.